ISBN 9781579409906. 5.25 x 7.5 inches. 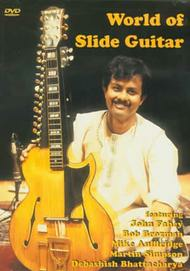 This DVD reveals a world of sounds - American, Hawaiian, Indian, English - vibrant with emotional nuances conjured by featured artists from a cold piece of steel. The 14 superb performances here demonstrate the slide guitar artistry of Bob Brozman, Debashish Bhattacharya, Mike Auldridge, Martin Simpson, and John Fahey. A 58-minute DVD.